Have you gotten your Groupon yet? If you’re not familiar with Chicago-based Groupon.com then you should be. Do you shop at Costco or Sam’s Club? Imagine Costco with one product available at a time, similar to Woot.com‘s Deal of the Day. It’s a simple concept, quantity discounts. A particular merchant, typically a local business, works up a deal. A good example would be a meal deal where you pay $20 for $40 worth of thai food at a local restaurant. Hungry for Thai food? Get out your credit card and get your groupon! Now in order for the “group” to get the deal 800 people must purchase a $20 meal deal. That’s where the collective buying power idea behind Groupon comes in to play. If 800 people don’t purchase the meal deal then you get your credit card refunded, just don’t go hungry. I think the really inventive part of Groupon is the impact for local businesses. It creates a whole new way to acquire new customers. I don’t know what the cost is for the business running the Groupon but I would imagine it’s a heck of a lot cheaper than direct mail coupons, Yellow Page Ads, and Print or Radio Advertising. 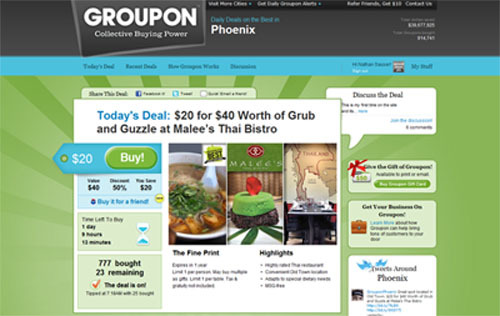 I will add Groupon to my Search Marketing toolbox. If you’re not working and hustling the electronic medium then you really need to get it together.